What does the Student Progress Report look like? Reading the Student Progress Report: Each time a student takes the MAP assessment you will see two bars grouped together on the graph. The first bar on the graph (in blue), labeled “Student RIT,” is the student’s score. 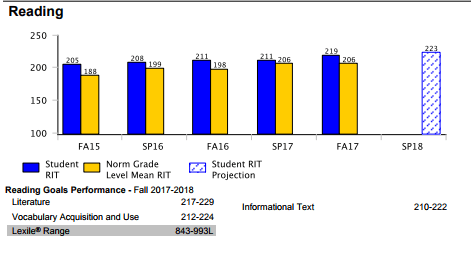 Second bar on the graph (in yellow), labeled “Norm Grade Level Mean RIT,” is the average score for students in the same grade as that student, in international schools who took the MAP assessment for that content area. After the fall sessions, you will see a bar with diagonal stripes on the far right of the graph labeled “Student RIT Projection.” The projection is generated by NWEA, the creators of MAP. The projection is based on average growth for students, internationally, who started at the same RIT range and were also in the same grade. The Lexile® range provides the readability of text based on the length of the words and sentences. The MAP Student Progress Report provides the Lexile® range for the student based on how they answered selected MAP reading items. To use the Lexile, visit lexile.com and enter the Lexile Range. The website will generate reading lists (books) for a particular Lexile level. These ranges correspond also to the ORT leveled books used in our Primary classrooms for reading instruction. (See comparison chart below.) However, the ranges and levels should not be the only determining factor in selecting reading materials for a student. Not all books have these designations, and it is important to choose topics and formats that are age appropriate and interesting to the student.